Posted on February 10, 2019 - By Fucosoft | Follow YouTube, Twitter to Get More Information. 4K is the latest resolution standard that has been developed for digital cinema, movies and computer games and graphics. 4K resolution standard has several advantages, for example, better fast-action, high image definition quality, larger projection surface visibility and more detailed picture quality. YouTube embraced and stated supporting 4K videos back in the year 2010. This has made it possible for YouTube users to stream and upload high-quality 4K videos. Unfortunately, according to Google terms of service, YouTube video downloading is not allowed. But this doesn’t mean that it is impossible. Still want to download 4K videos from YouTube? Here we’re going to show you 5 best 4K Video Downloaders for YouTube, Vimeo and other more 4K video sites. The list of 5 best 4K video downloaders for YouTube is not complete without mention Fucosoft Video Downloader software. This is a great tool that lets you download 4K/HD videos from YouTube and over 10,000 video sharing sites including Vimeo, Dailymotion, Facebook, Liveleak, MyVideo, BlipTV, Break, AOL, Adobe TV, Metacafe, Veoh, and more. Also, it allows you to download MP3 from YouTube without downloading the entire video file. Download videos with different quality and resolutions. Download multiple video formats and even convert them to other popular formats. Convert and transfer downloaded videos to portable gadgets like iPhone, iPod, Android devices, etc. Download videos 3X faster than other downloaders. Download online videos in a single click. Download only audio of an online video. Convert the downloaded video format as you need. Doesn’t allow you to automatically download videos while browsing the internet. 4K Video Downloader is a great tool that lets you download videos, playlists, channels, and subtitles directly from YouTube, Facebook, Vimeo and any other video websites in high quality. It is complete free to use and 100% safe that will not damage your computer. With this freeware, you can download videos in HD 1080p, HD 720p, 4K, and 8K resolution and enjoy these high definition videos on your HD TV, iPhone, iPad, Samsung Galaxy and other devices. Download annotations and subtitles in .srt format. Directly export downloaded videos and songs to iTunes. Compatible with all popular video sites like YouTube, Vimeo, DailyMotion, Facebook, Tumbr, etc. Smart Mode feature makes videos and songs downloaded easier and faster. An in-app proxy setup allows you to download videos that cannot be accessed in your country. 3D video and 360-degree videos download. Download high quality 4K and 8K resolution videos. Supports downloads from most popular video streaming sites. Available Windows, MacOS and Linux systems. Allows you to import links saved in CSV files. Lets you search and download subtitles on the basis of the track title. Limits you to download playlists with 24 videos or fewer. YTD Video Downloader is another free and reliable 4K video downloader for YouTube. It allows you to download and convert 4K videos from YouTube and other 50+ video sites. Also, you can use this tool to convert common video formats including MP4, WMV, FLV, MOV, 3GP, AVI, MP3 and many more. What’s more, it has an integrated video player that allows you to directly stream and video videos. Free download videos from 50+ sites. Convert videos to different formats including MP4, MP3, WMV, FLV, MOV, 3GP, MOV, etc. Download and watch videos later on other devices like iPhone, iPad, Samsung, HTC, etc. Download and convert videos to different formats. Comes with a simple integrated video player. Can only download and convert one video at a time. The download process is rather slow. Freemake Video Downloader is another free 4K Downloader for downloading videos from YouTube. This program allows you to download 4K & HD quality video clips from over 10,000 sites including YouTube, Facebook, Vimeo, Dailymotion, Twitch, Liveleak, Veoh and more. Also, it supports to download YouTube videos, playlists, channels in HD, MP4, MP3, AVI, 3GP, FLV, etc. formats. And you can rip web links to AVI, MKV, WMV, iPhone, PSP, Android, etc. Download YouTube 4K and full HD videos. Download and save full YouTube playlists and channels. Limit download speed when Internet connection is slow. Use proxy and parental control. Upload downloaded videos to Dropbox, Google Drive, OneDrive, etc. Works well with all popular video sites. Supports over 500 video and audio formats. Can’t download videos longer than three minutes. Adds a branded splash to the beginning and end of your downloaded video. aTube Catch is one of the most popular 4K YouTube downloaders loved by many users across the globe. Not only YouTube, you can also download videos from thousands of video sharing sites like Vimeo, Facebook, Dailymotion, Metacafe, Spike, Yahoo, Globo, RTVE, etc. Besides, it lets you export the downloaded content to your computer or mobile device like iPhone, iPad, PSP, Android devices, etc. Save bandwidth and other valuable computing resources. Convert downloaded videos to a number of popular formats for playback on a variety of devices. Built-in Screen Recorder to capture what you see on your screen. Create your own video or audio presentations. 100% Freeware, safe and clean. Download multiple videos at one time. Plenty of video and audio formats supported. Disc burning option to create VCDs, DVDs and Blu-ray discs. Has extra software in the installer. Some features are not visible. 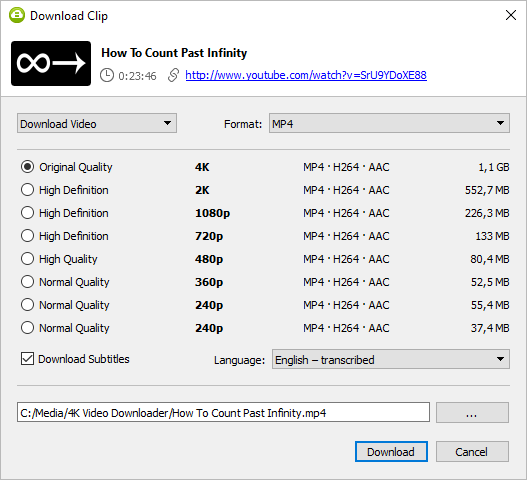 If you want to download 4K videos from YouTube and other video sharing sites, the above tools can help you do the task with ease. These 4K Video Downloader programs not only enable you to download your favorite 4K movies, but also let you to convert the downloaded videos to your desired formats. Just choose the one you like and start downloading 4K videos online. Sometimes you may accidentally delete 4K video files from your computer and even emptied the Recycle Bin. Fortunately, the lost 4K videos can still be recovered with video recovery software, such as Fucosoft Data Recovery. This program can help you recover deleted or lost 4K videos from hard drivers, mobile phones, camcorders, digital cameras, USB drivers and more.